For the fourth course I wanted to use an avocado foam, which I’ve made with success in the past. I decided to pair it with polenta and make a kind of deconstructed nacho. I prepared the polenta, but didn’t want to stir it for an hour, so I mixed it with a good salsa, poured it into individual ramekins and baked it in the oven. This didn’t turn out so well as the polenta didn’t cook all the way through and was extremely dry. For the second layer I put down some shredded cheese and had guests take turns with the blow torch to melt the cheese. I quickly made the avocado foam, but added too much milk and there wasn’t enough fat to create a good, thick foam. So the third layer ended up being a watery, anemic mess. Not a good tasting (or looking) dish, but the blow torch part was definitely a success; all the guests came running to look once they heard the deep whoosh of the butane start. See Molecular Gastronomy Party for the complete menu. For the third course I wanted to make the infamous pea “ravioli”. Unlike the mint spheres, the pea ravioli were free form… and VERY hard to make into perfect spheres. If I put the teaspoon into the calcium bath it glommed onto the spoon. A fast drop from above the water wasn’t much better as it turned into spaghetti-like strings. A slow pour was the closest we came, but they were still misshapen blobs with tails (most of them were shaped like sperm). 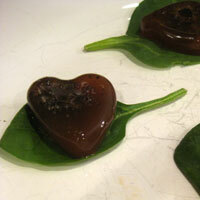 To spice them up, I spiked the water bath with truffle oil, but the truffle flavor didn’t come through enough. They needed more salt and more… something. 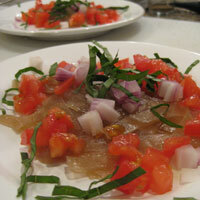 One guest had a brilliant suggestion of making them (next time) with tarragon. So even though they didn’t taste too exciting, it was a very cool sensation biting into the “ravioli” and having them burst open. 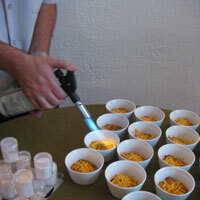 This course was originally going to be chorizo cream spheres in cider, a second recipe from “My Molecular Cuisine Kit”. I had the foresight to try this recipe out ahead of time and the results were disgusting; the cream mixture got very thick when spherified and it was the texture of wet cat food. Ugh. I had already purchased bottles of Val de France sparkling apple juice so I decided to re-tool the recipe, and mint spheres sounded like they would go well with the cider. I started with a simple syrup of mint leaves but the flavor wasn’t strong enough so I added some mint tea. Then the color was too brown so I added some green food dye to boost the color. I mixed 500ml of the mint syrup and 5.2g sodium alginate with an immersion blender, poured into 1/2 sphere silicone molds and froze for 2 hours. Once frozen, the 1/2 spheres were dropped into a calcium bath (36oz water mixed with 5g calcium chloride). As they melted, they morphed into perfectly round spheres, like magic. And looked a lot like olives. 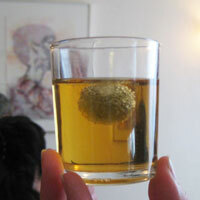 The spheres were then rinsed in clean water and dropped into shots of apple juice. The drink had a refreshing burst of sweet mint set against the carbonated, slightly sour cider. This was a recipe from “My Molecular Cuisine Kit”, which involved heating honey with some water and agar agar. Within seconds of taking the honey off the heat there was a swarm of crazed bees outside my door trying to get in. I never really knew what was behind the saying “make a beeline”, but now I understand. The recipe said to drop the honey mixture from a pipette into a very cold container of grapeseed oil. We tried this over and over again, even adding more agar agar but unlike water and oil, honey and oil really do seem to mix. We totally scrapped that recipe and at T minus 30 (T being party time) went hunting for a different one. My friend found this one and disaster was averted. 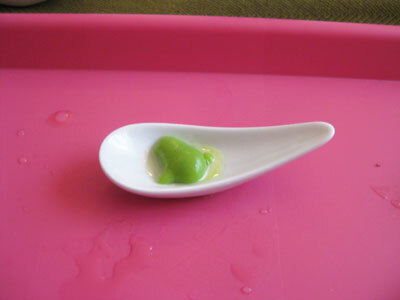 It was a more traditional spherification technique using the combination of sodium alginate and calcium chloride to form the gel-like skin upon contact of the two ingredients. This time when we dropped the honey mix from the pipette beautiful little pearls formed. Because we didn’t have time to let the mixture set, ours were a little on the opaque side, but I kind of liked that. 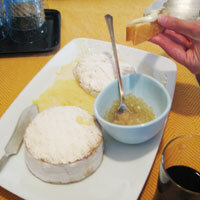 The Camembert and a goat cheese brie were baked at 350° until the cheese started to ooze out. The combination of crusty French bread, gooey cheese and the delicate, clean burst of honey when the pearls popped was delicious. Thurs AM: Woke up early and made mom Maple Bacon Pancakes – a great and easy mix from Bacon Freak. Thurs PM: Scored last minute dinner reservations at Mozza. Our awesome waitress steered us right, starting off with burrata, leeks & charred bread and affettati misti with gnocco fritto: prosciutto wrapped around breadsticks packed with truffle butter, beautiful cuts of house-cured speck, pancetta, and sopressata eaten with pillow-y, fried potato puffs. For mains we had a delicate, light & buttery halibut with ramps and Ricotta & Egg Raviolo with browned butter. Fri AM: Loteria Grill at Farmer’s Market: CHILAQUILES in poblano mole with eggs. What? Yes. Fri PM: Kyochon Fried Chicken, pickled daikon, orange butter rice (made in my donabe), and a mango/strawberry galette. 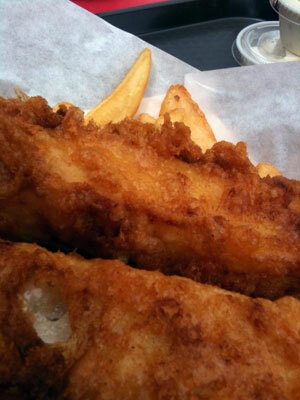 Sat AM: Beautiful, light and crisp fish and chips at Malibu Seafood. Do I have to go to the bacon bacon truck, or will it come to me? 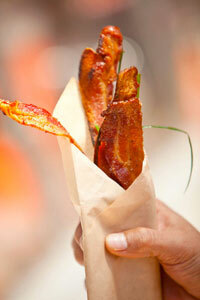 Their bacon bouquet looks amazing… and so does this. 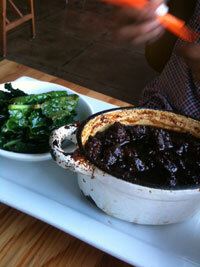 Whenever I’m anywhere near (or even not-so-near) Highland Park I have to stop in at Good Girl Dinette. 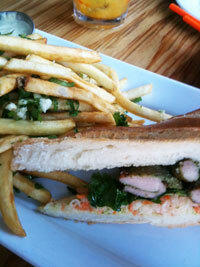 Their Galangal Chicken Bahn Mi is amazing. This one comes with tender dark meat chicken marinated in soy and galangal and a slaw of daikon and carrot. They also make other things that are quite good: Vietnamese Pork Confit (below), Curry Chicken Pot Pie, Rice Cakes with Crispy Scallion Tofu and special homemade sodas. The Slow-Cooked Salmon recipe is from the Chez Panisse Café Cookbook and is absurdly simple: Preheat oven to 200 and place a pan of warm water on the lowest rack. 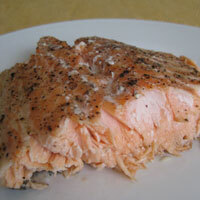 Brush both sides of the salmon fillet with olive oil, salt & pepper. Place salmon on a baking sheet and cook for about an hour. I had a not-so-fancy cut of salmon and it turned out like butter. Mmm butter. I served it with Spaetzle & Panko. 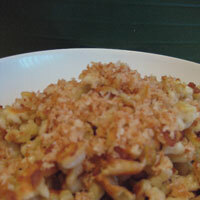 The spaetzle was hearty, buttery and crunchy. 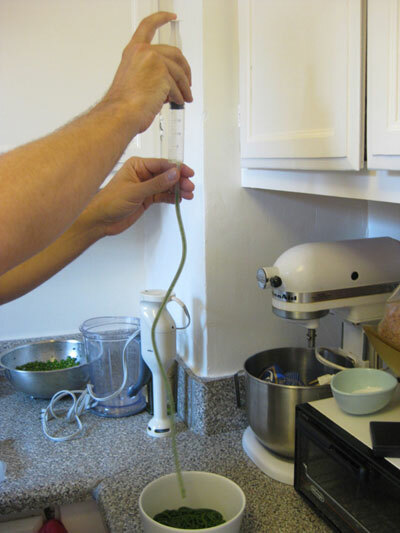 And not so hard to make if you have a handy spaetzle maker . My first brush with molecular gastronomy was eating at WD50 back in 2007. We were invited into the prep area and it looked more like a laboratory than a kitchen. It was intimidating. Then after watching seasons of Top Chef the idea of trying it at home became more reasonable. Then I came across the Experimental Texturas Kit and it was on. Our evening started out with doughnut soup, which as it sounds, would have been better suited to dessert. My friend made HOMEMADE rice milk (yum) from sushi rice and mixed it with cream, coffee, cinnamon and poured it over doughnut crumbs—glazed Krispy Kremes that had been processed lightly in the Cuisinart and then toasted until super crunchy. Freaking delicious. Next up was lamb “pasta” with avocado foam. We added Gellan to lamb consumé, poured it into a sheet pan, let it cool and then sliced it into strips, like fettuccine. The weird thing with Gellan is that you can heat it back up and it will retain its form. We served the re-heated pasta with diced onions, tomatoes, julienne of basil and avocado foam (avocado and milk charged with N2O). This dish was a textural fail—the noodles were crunchy and glutinous at the same time. A little like eating soggy rubber bands. We then had a spinach salad with delicious homemade Green Goddess dressing, fresh grapefruit and… spherical Mozzarella! I think out of everything we tried with Texturas, the Mozarella turned out the best. 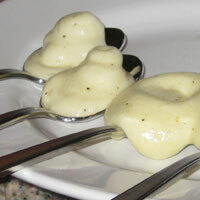 A little like burrata, with a creamy liquid center. My friend then made mini-eggs by doing things with a syringe and Xanthan gum. Not quite sure what he did, but they turned out great served on Parmesan crisps with blanched kale, a touch of white balsamic and smoked salt. The next thing we tried looked pretty but after the lamb aspic hot mess we had to dare each other to eat it: re-hydrated morel mushrooms and broth mixed with Kappa and poured into heart-shaped molds. Yep, tasted like mushroom jello. Gross. My favorite dish of the night didn’t involve any molecular trickery. 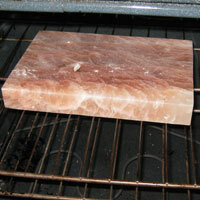 It was thinly sliced lamb shoulder and top loin steak “grilled” table-side on a Himalayan salt block . The block, made entirely of compressed salt, was heated in the oven at 475 for an hour, then transferred to the table where we seared our meat. 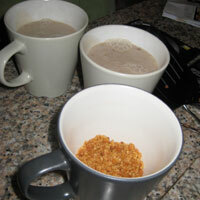 As it cooked, the salt melted a bit and mixed with the juices imparting a deep salt flavor. For dessert #1 we tried to make ginger & lychee ice cream “caviar” with Algin and Calcic. I think we got the measurements wrong as it didn’t gel up and the pearls melted into the water bath. Boo. Dessert #2 was another foam, this time with pineapple juice, meringue powder and long pepper. Success! 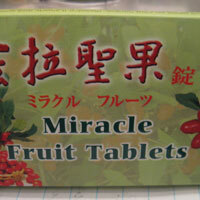 The last dessert involved Miracle Berries, which make sour things taste sweet. We raided the kitchen and ate preserved lemons, limes, grapefruit juice and salt & vinegar potato chips. 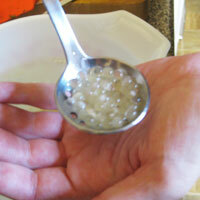 And just to be fancy, we drank soda water with pearl dust. It was an exhausting but super fun day in the kitchen!